Recently one of the long-time owners of the ballroom dance studio that I train at passed away after a lengthy illness. Since he was Scottish, I decided to make some Scottish Shortbread as a small tribute to him. This recipe is easy to make but has a long baking time (over an hour). The shortbread has an airy and crumbly texture, yet it’s solid enough to support various toppings. This recipe is great for customizing to your taste. I made a second batch where I added 1 teaspoon of cinnamon to the flour mixture. I also experimented with toppings and whipped up a quick orange glaze by adding a couple of tablespoons of fresh squeezed orange juice to some confectioners (powdered) sugar until the glaze reached a pourable consistency. And finally, I capped off the Scottish Shortbread making day by making an orange-lemon curd. Basic Scottish Shortbread Basic Scottish Shortbread recipe customized with the addition of an orange glaze. 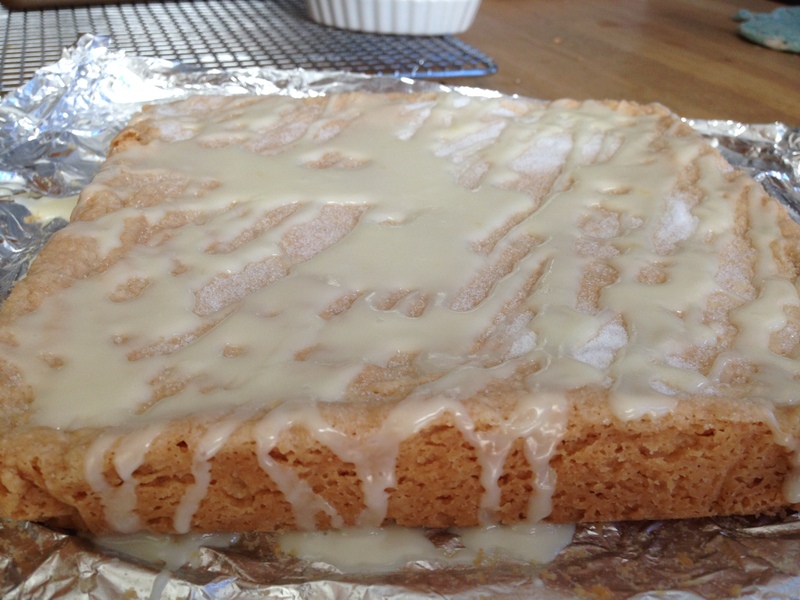 Scottish Shortbread topped with orange-lemon curd. Position a rack in the middle of the oven. Heat the oven to 300°F. Line an 8×8-inch pan with heavy aluminum foil, letting the foil extend over two sides of the pan. Sift the flour, cornstarch, salt, and cinnamon (if using) into a large bowl. Add 1/2 cup of the sugar to the flour mixture, and, with an electric mixer on low speed, mix to just blend the ingredients. Add the butter pieces and vanilla and mix until large (1/4- to 1/2-inch) crumbs form, about 2 minutes. Gently press the dough evenly into the prepared pan. Don’t pack the dough into the pan. Bake until the top of the shortbread just begins to turn golden, about 1 hour and 10 minutes. After removing the shortbread from the oven, immediately sprinkle 2 tablespoons of sugar over the top. 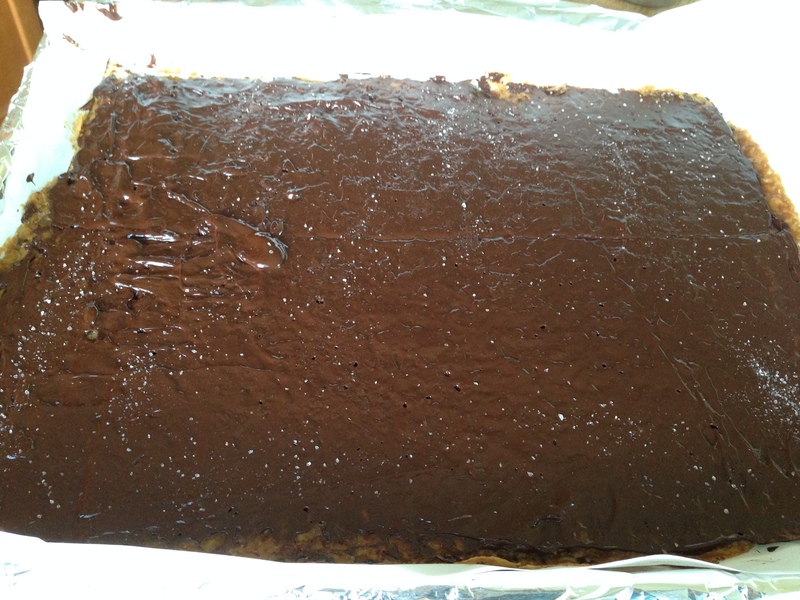 Cut the shortbread into 16 squares (while it is still in the pan), being sure to cut through to the bottom. Don’t wait until the shortbread is totally cool before cutting as the shortbread will crumble if you try to cut it when it’s too cool. Cool completely before lifting the foil and shortbread from the pan. 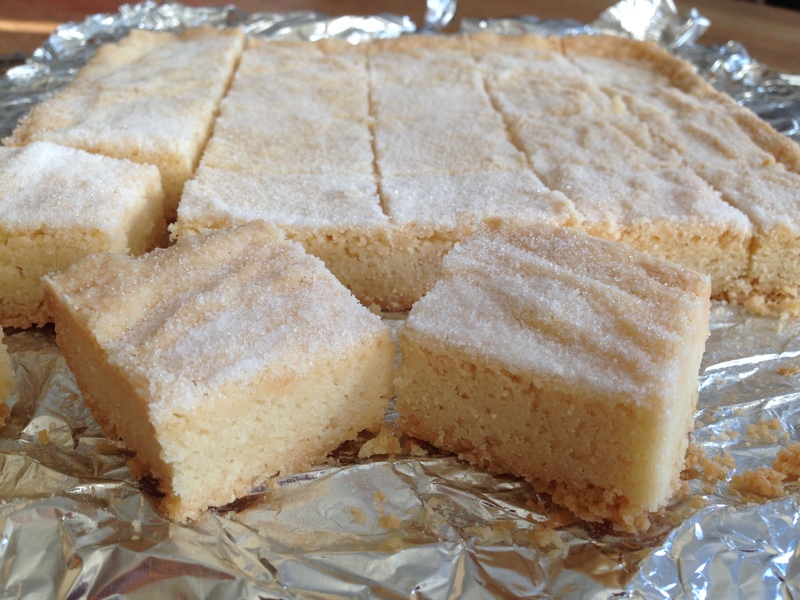 Cut the shortbread into 16 squares (while it is still in the pan), being sure to cut through to the bottom. Don’t wait until the shortbread is totally cool before cutting as the shortbread will crumble if you try to cut it when it’s too cool. While the shortbread is cooling, stir a few tablespoons of fresh squeezed orange juice into one cup of confectioners sugar until the mixture reaches a pourable consistency. Wait until the bars have totally cooled before drizzling the glaze on top. When I was in graduate school, my girlfriends and I would go out to afternoon tea, and for me the scones and biscuits mainly served as vehicles for consuming as much sweet, tart, creamy lemon curd as possible. It took me too many years to realize that homemade lemon curd isn’t that tricky to make, and this recipe ensures that you can have lemon curd any time you want. For this version, I didn’t have enough fresh lemon juice, so I substituted some fresh squeezed orange juice too. The orange juice cuts the tartness a bit and makes the curd a little sweeter. 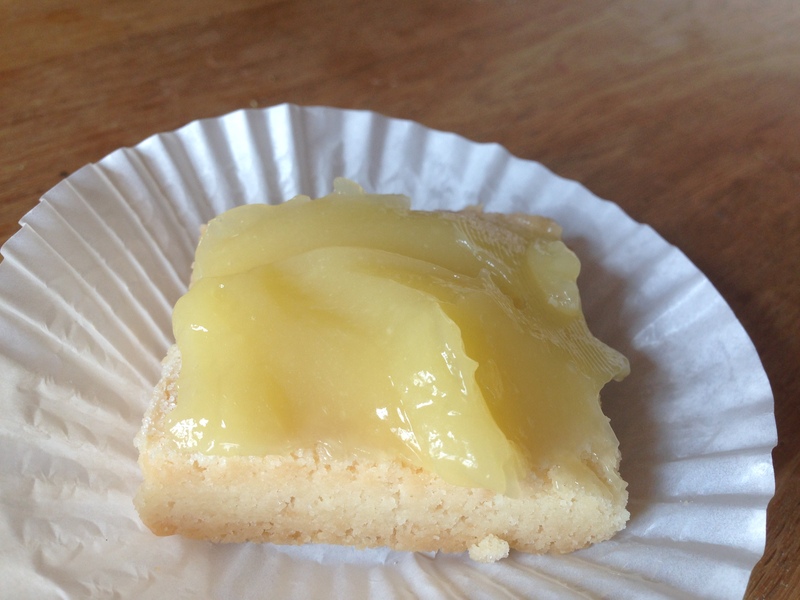 Orange-lemon curd is an especially good topping for Scottish Shortbread. Fine Cooking provides a really useful picture tutorial of the curd making process. You can find it here. In a large bowl, beat the butter and sugar with an electric mixer, about 2 minutes. Slowly add the eggs and yolks. Beat for 1 minute. Mix in the orange and lemon juices. The mixture will look curdled, but it will smooth out as it cooks. Increase the heat to medium and cook, stirring constantly. Don’t let the mixture boil. Cook until the mixture thickens, about 15 minutes. It should leave a path on the back of a spoon and will read 170°F on a thermometer. Remove the curd from the heat. Strain the curd to remove any egg solids that may have formed, and transfer the curd to a bowl. Press plastic wrap on the surface of the curd to keep a skin from forming, and chill the curd in the refrigerator. The curd will thicken further as it cools. Covered tightly, it will keep in the refrigerator for a week and in the freezer for 2 months. It’s a Brownie Recipe Match Up. In this corner, the reigning champion, hailing from Trader Joe’s weighing in at 16 ounces and representing box mixes…Brownie Truffle Baking Mix! And in this corner, the challenger, coming all the way from Saveur Magazine and touted by some as out of this world…Supernatural Brownies! While I usually prefer to bake from scratch rather than a mix, I’ve found that the phenomenal brownies made from Trader Joe’s Truffle Brownie mix are the brownie standard I tend to judge any brownie recipe against. So, I had extremely high expectations for this Supernatural Brownies recipe given its name. The “Supernatural” brownies are really good looking with a shiny, crackly top, and they rose well with a fudgey interior, but in terms of taste, I didn’t find anything extraordinarily great about them. 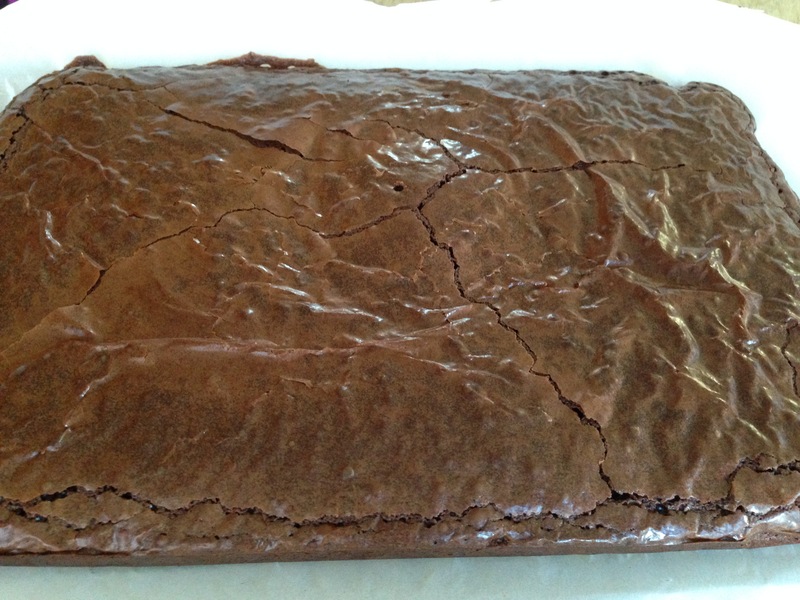 That said, brownies are inherently delicious, and these are too… just not supernaturally so. 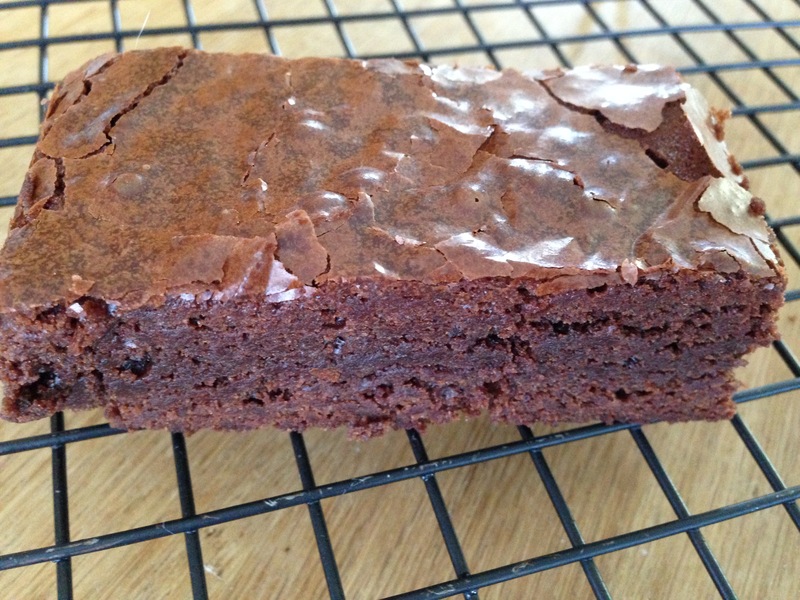 Trader Joe’s Truffle Brownie mix continues to hold tight onto the best brownies title. 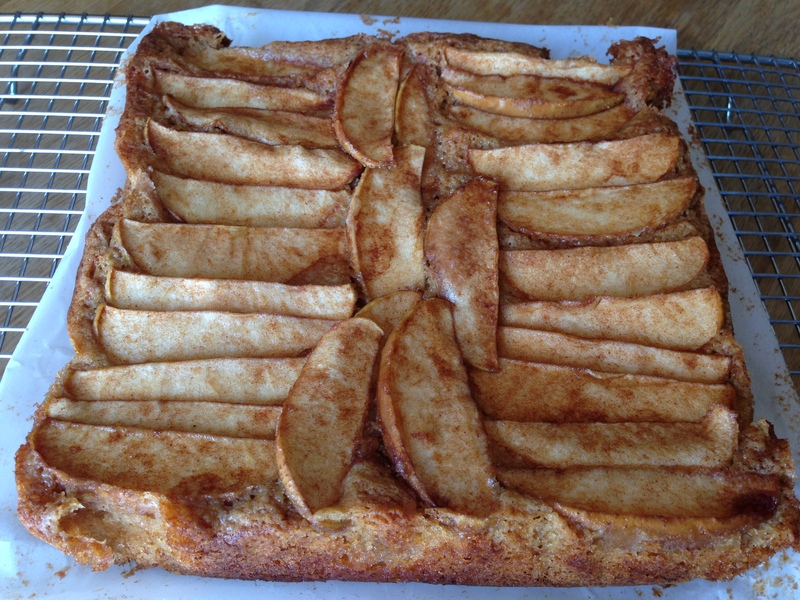 Grease a 9″ x 13″ baking pan with butter and line with parchment paper. Set pan aside. Pour enough water into a 4-quart saucepan that it reaches a depth of 1″. Bring to a boil; reduce heat to low. Combine butter and chocolate in a medium bowl, and set the bowl over the saucepan. Cook, stirring, until melted and smooth, about 5 minutes. Remove from heat and set aside to cool. Stir in the chocolate mixture (make sure the chocolate mixture is not too hot, and if it’s a bit warm, trickle it in slowly and mix quickly). Pour batter into prepared pan; spread evenly. 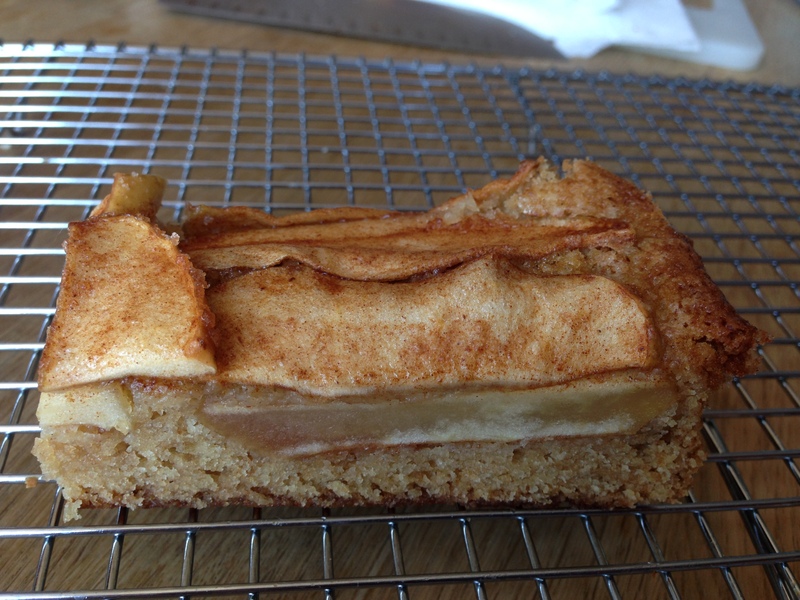 Bake until a toothpick inserted into center comes out clean, 30–35 minutes. Let cool on a rack. Cut and serve. After making too many batches of mazoh toffee candy, I was craving something sweet that wasn’t candy. 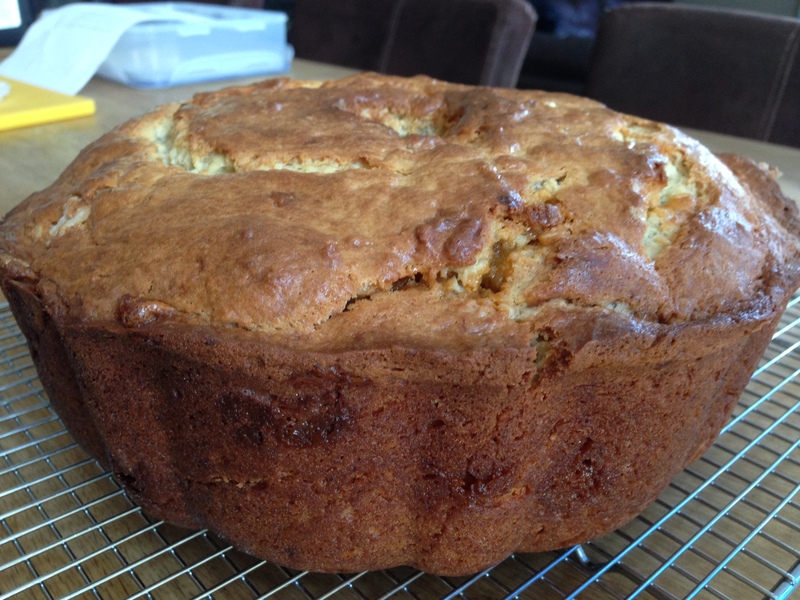 So, I whipped up banana bread in bundt cake form. Usually I would deem this banana bread a bit too plain for my taste as the banana flavor was mild, and the cake had just a touch of sweetness. But I did like how tender and moist the cake is, and the addition of butterscotch chips gave this understated banana bread just the pop of flavor it needed. This banana bread provides a good base for piling on toppings like caramel sauce or ice cream and getting creative with add-ins. Grease and flour a large bundt pan. In a mixer bowl, cream butter and sugar together. Add mashed bananas and beat. Combine the flour, baking soda, and baking powder in a separate bowl. Add the dry ingredients and sour cream alternately to the mixing bowl. Beat well until all combined. Pour batter into bundt pan, and bake for approximately 60 to 70 minutes or until a toothpick comes out clean. Cool in pan for 10 minutes. Then invert onto a cooling rack, and allow the cake to cool before slicing. 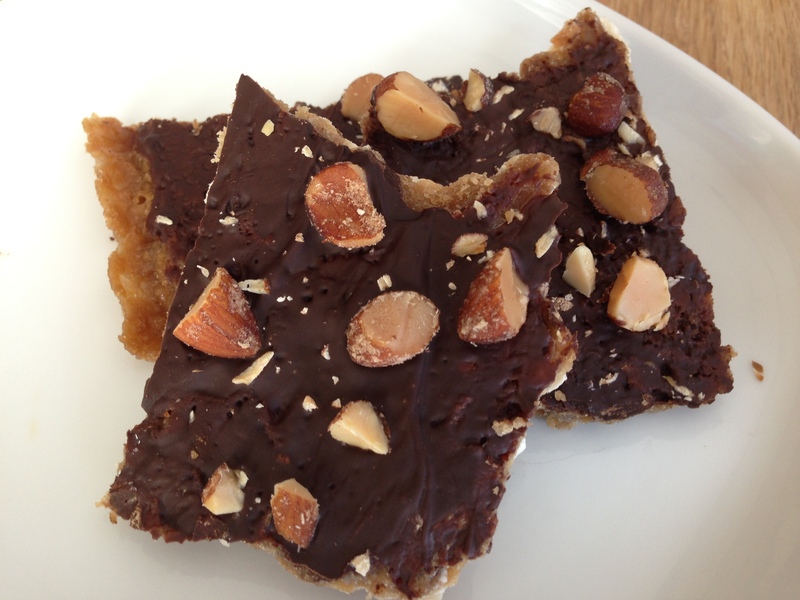 It’s Matzoh Madness in my kitchen, but probably not in the typical way. It’s becoming apparent to me that I may have bit off more than I could chew in terms of my ability to make good use of my recent purchase of a five pound superpack of matzoh. 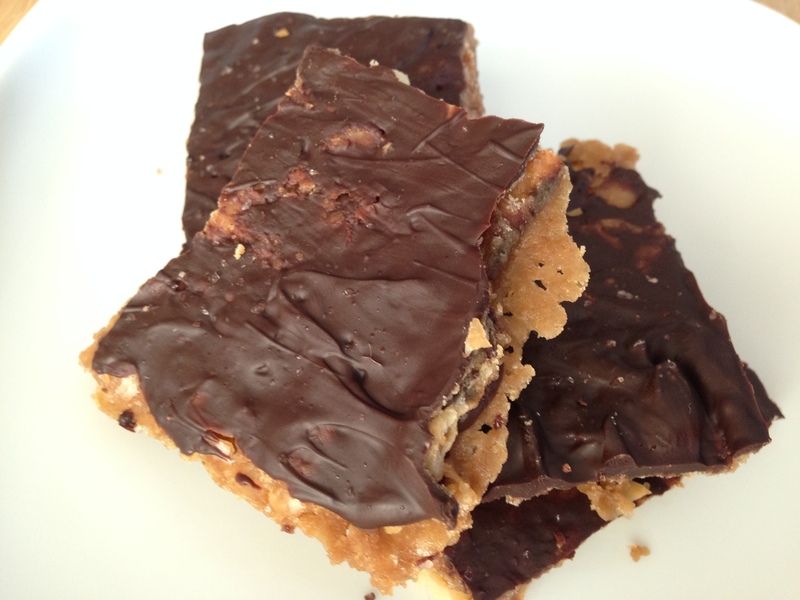 After making my first two batches of matzoh-inspired treats (Chocolate-Covered Caramelized Matzoh Crunch) and realizing that I had only used up half of one package of matzoh, I decided to try another variation of matzoh candy. These Matzo-Almond Croccante are more toffee/brittle like than the Chocolate-Covered Caramelized Matzoh Crunch, and everything is heated over the stovetop. The caramel is very firm (like a brittle) and extra sweet as it’s made from white sugar and honey, and the matzoh isn’t baked, so you get a greater contrast of textures and flavors. You may be tempted to leave out the sprinkle of sea salt and cayenne pepper on top of everything, but the heat from the cayenne provides an unexpected twist to the sweetness. 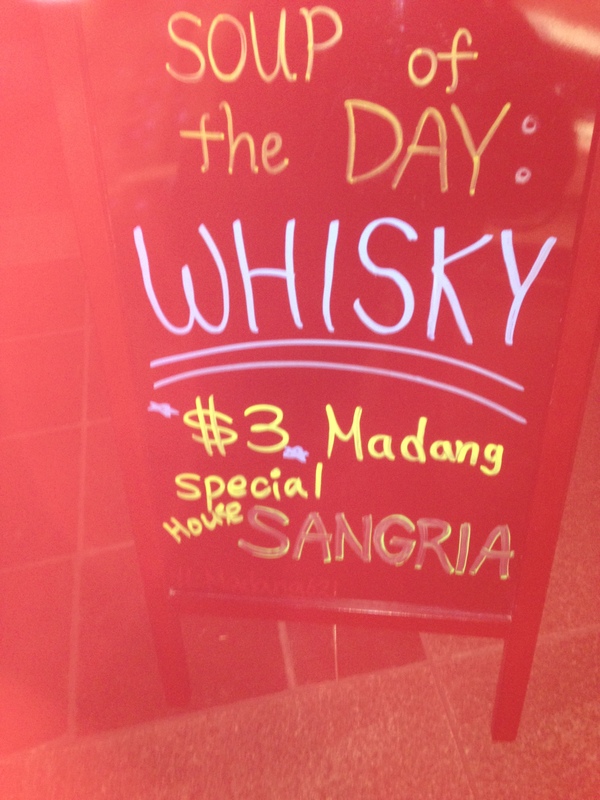 You can also customize your toppings. My second batch was made with chopped pecans. Mazoh is slathered with a toffee caramel (made from white sugar and honey), sprinkled with toasted sliced almonds, drizzled with dark chocolate, and dusted with Maldon sea salt flakes and cayenne pepper to create a sweet, salty, nutty, rich, and spicy package. If you look closely, you can see all the different ingredients in this close up. Even after making my first batch, I still had a few sheets of matzoh left in my first 1-pound box, so I made a second batch with chopped pecans. Place matzoh on sheet in a single layer, breaking as needed. Don’t overlap matzoh too much but don’t leave any gaps. 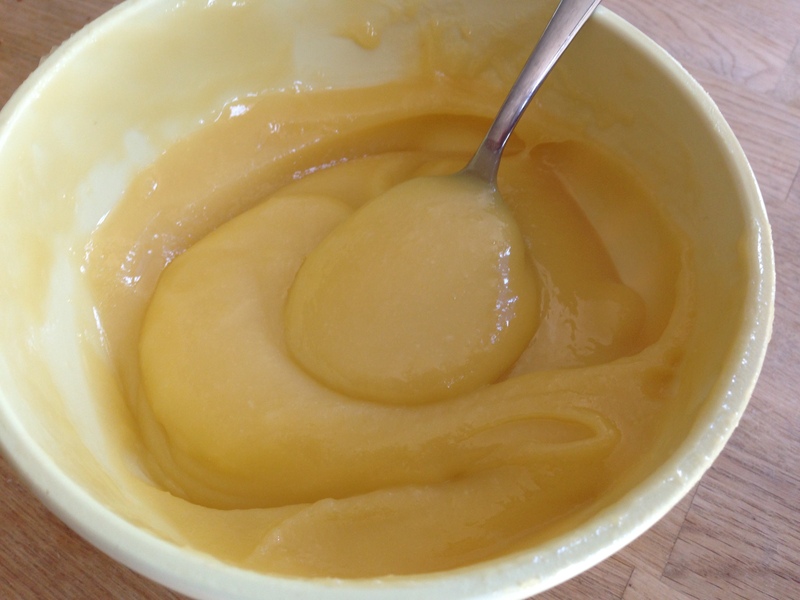 Stir sugar, butter, honey, and 1/4 cup water in a heavy saucepan over low heat until sugar dissolves. Increase heat to medium-high and boil without stirring, occasionally swirling pan and brushing down sides with a wet pastry brush, until caramel is a deep amber color, 13–15 minutes. Pour caramel evenly over matzoh. Immediately sprinkle almonds over. Let cool. Drizzle melted chocolate over caramel. Sprinkle cayenne and salt over. Let stand until chocolate sets, about 30 minutes. Break into pieces. March Madness may be coming an end, but I’m in the midst of my own matzoh madness after buying 5 pounds of matzoh at the grocery store (the supersized pack was on sale for $6). In my defense, I’ve only bought matzoh one other time in my life, so I wasn’t well informed about how much matzoh that really is (that’s at least 85 sheets of matzoh). 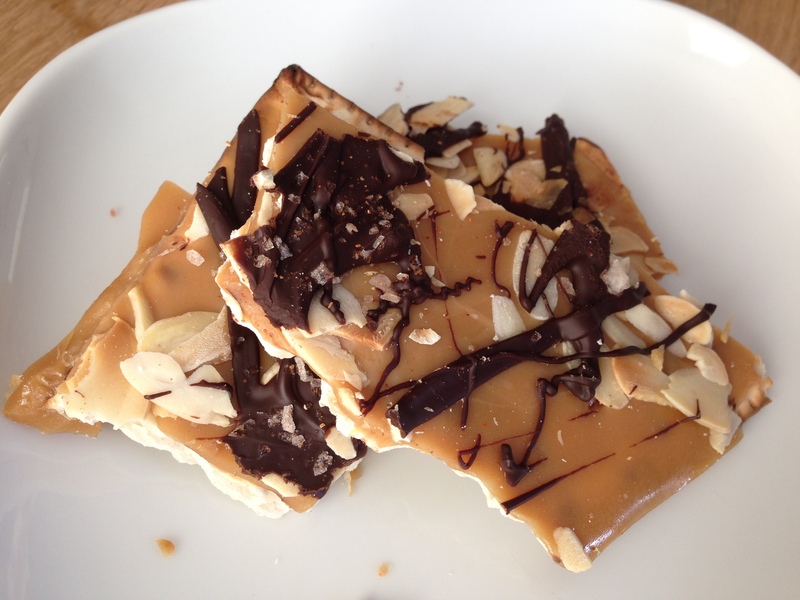 Plus, I’ve been eyeing the recipe Chocolate-Covered Caramelized Matzoh Crunch, so I’ve had matzoh on my mind recently. Initially I thought that I would just give away some of the extra boxes of matzoh to my friends, but after tasting it, I realized that it would be like giving someone a box of Saltines (but without the salt). 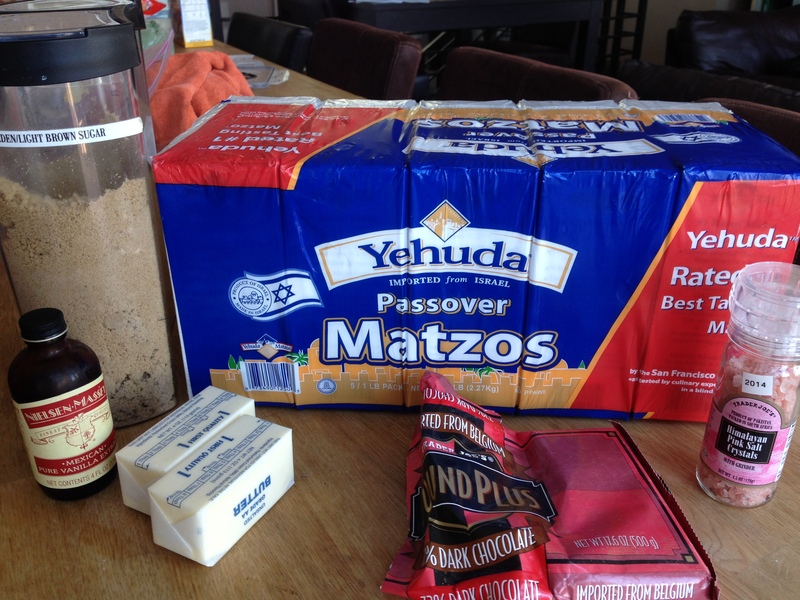 So, I’m left to find as many matzoh inspired sweets to make. 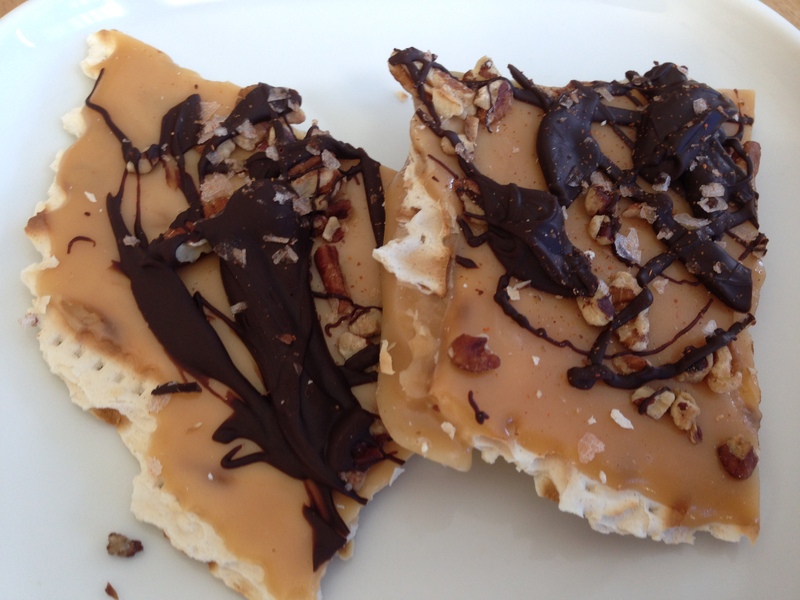 First up is Chocolate-Covered Caramelized Matzoh Crunch. At it’s most basic version, this candy consisted of a bottom layer of matzoh topped with a brown sugar caramel baked until the caramel bubbles up and gets a bit foamy. Then dark chocolate is spread over the top (with a sprinkle of sea salt), and the result is an airy, flaky, crispy candy that you can customize in infinite way. 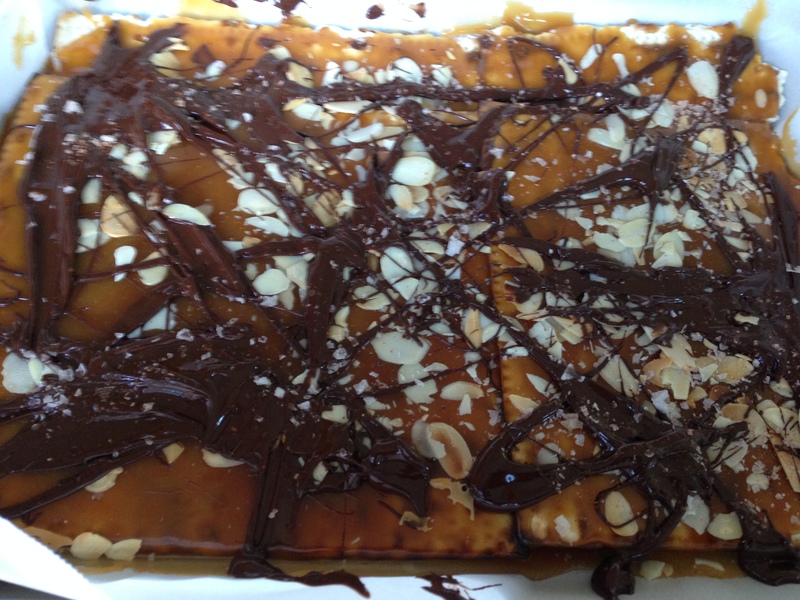 There’s actually matzoh and caramel hiding underneath all that chocolate. This recipe magically transforms bland, boring matzoh into a crunchy, sweet, slightly salty, caramely candy. After making my first batch, I quickly realized that I had barely made a dent in reducing my matzoh stash as I had only used up about 1/3 of one 1-pound package. So, I made a second batch with mesquite smoked almonds sprinkled on top. Line a rimmed baking sheet (I like to use an 18×13 inch half sheet pan, but this also works for an 11 x 17 inch baking sheet) completely with parchment paper, making sure it goes up and over the edges. This recipe gets messy so make sure your pan/sheet is well protected. You can also use heavy duty foil, but I prefer parchment paper because it doesn’t stick at all. Line the bottom of the sheet pan with matzoh, breaking extra pieces as necessary to fill in any spaces. I prefer not to overlap the pieces, but I make sure that there are no big gaps between the sheets of matzoh. In a 3-4 quart heavy duty saucepan, melt the butter and brown sugar together, and cook over medium heat, stirring, until the butter is melted and the mixture is beginning to boil. Boil for 3 minutes, stirring constantly. Remove from heat. Pour the mixture over the matzoh, spreading with a heatproof spatula. It will be a very thin layer. Put the pan in the oven and reduce the heat to 350°F degrees. Bake for 15 minutes. As it bakes, it will bubble up, but check every once in a while to make sure it’s not burning . If it burns in spots, remove from oven and reduce the heat to 325°F, then replace the pan. Remove the pan from oven, and immediately sprinkle chocolate chips in a thin layer over the top. Let stand for 5 minutes, then spread the melted chocolate with an offset spatula. While the chocolate is warm, if you wish, sprinkle with toasted almonds (or another favorite nut, toasted, and coarsely-chopped), a sprinkle of flaky sea salt, or roasted cocoa nibs. You can lightly press the nuts into the chocolate to ensure that they stick. Let cool completely (I refrigerate after the pan has cooled down a little to help speed up the setting process), and then break into pieces and store in an airtight container until ready to serve. It should keep well for about one week.